The government will be forced to spend tens of millions of additional pounds to keep its no-deal ferry contracts in place if Brexit is delayed. In December the Department for Transport contracted three suppliers to provide additional freight capacity on ferries for lorries. That was in case a no-deal Brexit led to congestion on roads to the coast. 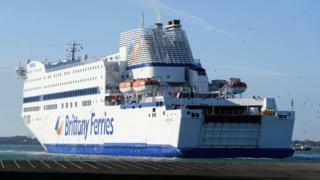 Brittany Ferries, one of the contractors, said it had already incurred large fuel and staffing costs. It said it would need to be compensated for those expenses. Although the UK could still leave the EU as planned on 29 March, MPs have voted in favour of asking the EU to delay Brexit. The government’s procurement of additional cross-channel ferry services has already led to the collapse of a contract with the ferry-less Seaborne Freight, and cost the taxpayer £33m for a settlement with Eurotunnel. Seaborne Freight had its deal cancelled after the Irish company backing it pulled out. Meanwhile, Eurotunnel sued the government because it had not been considered for a contract. It argued that unlike Seaborne, it has actually run a cross-Channel ferry service (MyFerryLink, which closed in 2015) and should have been approached. Transport Secretary Chris Grayling has been heavily criticised for the Seaborne deal, which would have been worth £13.8m. A report in February by the National Audit Office (NAO) revealed that the deals with DFDS, Brittany Ferries and Seaborne Freight, worth more than £100m, contained no provision for the start date to be delayed beyond 29 March. Labour’s shadow Transport Secretary, Andy McDonald, called this decision “shocking” and accused Transport Secretary Chris Grayling of “squandering huge amounts public money”. But a Whitehall source said the contingency sailings had to be ready for the original Brexit date, and referred to the possibility of further payments as “the cost of keeping no-deal on the table”. The NAO also said that the cancellation of all three contracts prior to the end of March would incur a maximum termination charge of £56.6m. Brittany Ferries said it had planned 20 additional weekly sailings – the equivalent of 2,000 nautical miles – employed extra staff, and moved 20,000 passenger bookings to accommodate the Department for Transport (DfT). “The new schedule cannot now be changed, even as an extension to Article 50 [meaning Brexit is delayed] seems likely,” it added in a statement. A DfT spokesperson said that despite a vote to delay Brexit in the Commons on Thursday, “the legal default in UK and EU law remains that the UK will leave the EU without a deal [on 29 March] unless something else is agreed”.